It is with great sadness and a heavy heart that I must today begin by reacting to the horrendous news that reached us here in Antalya from Paris. The OECD condemns in the strongest terms the barbaric terrorist attacks perpetrated last night. On behalf of the Organisation, I want to express my heartfelt condolences and solidarity with our host country France, the French people, and the City of Paris and its citizens following these terrible attacks. The impact of these atrocities is all the more poignant as Paris is literally our home, where we have our headquarters and where I along with the majority of over 2500 OECD staff and representatives of our 34 Member countries and their families live. I have written to the French President and Prime Minister to express these sentiments on behalf of our Organisation. Our condolences, thoughts and prayers are most particularly with the families of the victims of these atrocities. This is a moment when we must all stand more united than ever in defence of the freedoms our democracies hold dear. I would like now to outline briefly for you the OECD’s perspective on, and contribution to, the G20 activities, work and agenda this year under Turkey’s Presidency. This has been a very active contribution, wide-ranging and multifaceted – which, hopefully, will contribute to the success of the Antalya Summit. But before elaborating on how G20 is contributing to a fairer and more inclusive global economy, let me recall the economic “backdrop”. Global growth prospects have dimmed again this year. Our Economic Outlook, released last week, showed a dramatic slowdown in global trade growth this year. This is genuine cause for concern. World trade has usually been the “bellwether” of global output and such weak numbers have tended to foreshadow a global recession. Socially: With inequalitiesat an all-time high in many OECD countries and are even wider while inequalities in emerging market economies. The OECD has shown that this has a negative impact on growth. We are also faced, notably but not only, in emerging countries, with issues such as poor quality jobs and informality. Environmentally: We are on a collision course with nature and the carbon clock is ticking! The OECD has just released a new report with updated numbers on the economic impact of climate change and consequences of inaction on this front. The latest OECD analysis shows world GDP in 2060 could be lowered by 2% on average, and in South and Southeast Asia by nearly 4%, mainly due to losses in agriculture and sea level rises. To what extent has the G20 agenda, this year, contributed to addressing those defining challenges? How can it make a difference in terms of turning the world into a more prosperous and fairer place? And how has the OECD, itself, participated in G20 efforts in these areas? I am proud that the OECD actively contributed to Turkey’s “Implementation, Investment, Inclusiveness” trilogy. Let me give you a couple of examples and illustrations of our contributions to the robust and inclusive growth ambition of the Presidency. by providing a quantitative assessment of progress towards the 2% additional growth target. Our assessment, jointly with the IMF and the World Bank Group, has found that less than one half of the policy commitments encapsulated in the National Growth Strategies have been fully implemented. These should raise G-20 GDP by around 0.8% by 2018. This is a start, but not enough: implementation of their growth commitments by G20 countries must be accelerated! The OECD also supported G20 countries in the elaboration of ambitious G20 country investment strategies. Revision of the OECD Principles of Corporate Governance, and their transformation into G20/OECD principles, and which will also be presented to theLeaders. Skills strategy: The OECD, jointly with ILO developed a G20 Skills Strategy to counter inequality and grapple with low productivity growth in many G20 countries. Youth employment: The OECD will monitor implementation of plans to reduce the number of young people not in work, education, training, or working in the informal sector. Job quality: A G20 Quality Job Framework was developed by the OECD with inputs from ILO. Of course, this change of perspective by the G20 on growth and inclusiveness still needs to be made operational across the range the G20’s work, including in the finance sector , and specifically into the National Growth Strategies. But this is encouraging and the OECD will continue to support this refocusing of the G20 agenda. Some of you were perhaps there. The OECD delivered on the remaining action points of the G20/OECD Base Erosion and Profit Shifting project to Ministers of Finance in Lima, in October 2015. This is the culmination of intensive work since the crisis to lay the foundations of a fairer, more transparent and more effective international tax system. Under the mandate given by Ministers of Finance to the OECD in Ankara in September, to be submitted to Leaders here in Antalya tomorrow, the OECD will be developing the tools and the mechanisms for implementation and follow-up of the 15 BEPS agreed actions. The OECD which hosts the Global Forum on Tax transparency hosted at will continue to support and monitor progress towards the implementation of Automatic Exchange of Information and implementation of the international standards on Exchange of Information on request. To conclude: In our view, under the Turkish leadership, the G20 has made a very meaningful contribution to the global inclusive growth agenda. 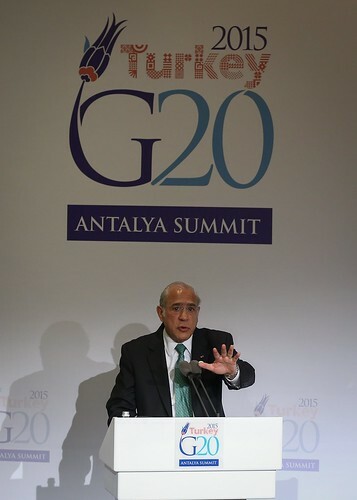 Implementation, in all these all areas will be the touchstone of G20 credibility. Thank you.